Lori Riggins Photography: One just for fun! It seems like I only post pictures of Becca, but only because she's a much more willing model for me than Ryan! I pull out the camera when he's around, and he just groans. I was able to catch this one, though, of him performing his new talent - juggling! His baseball coach challenged the team to learn to juggle to improve their hand/eye coordination, and it really didn't take long at all for him to pick it up! This is a neat shot... the tennis balls really stand out and i love the texture on the background. That is an awesome shot! The color of the balls really jump out to me. Cool!! The tennis balls really stand out!! Very nice! I like the way the tennis balls stand out too. I'll have to give my DS that tip about juggling. Wow--love the look of concentration on his face. Great shot! He should let you take his photo more often. wow! cool shot! love teh bricK! and good for HIM! Cool shot! I like the green against the neutral background. Hahaha. Wow. You did so great those all in there. 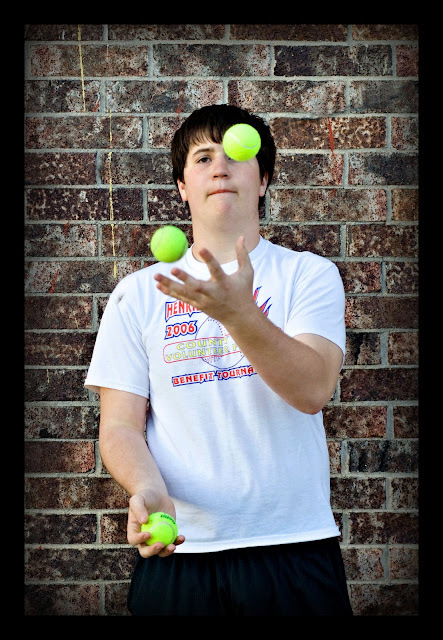 I can't juggle one ball, so I am impressed that he can do that many! Wow, great color and focus. That's really cool! I wish I knew how to juggle.